Wowza have proven themselves to be the very best video streaming platform available. Many thousands of organizations have deployed Wowza to enable their Corporate Streaming infrastructure, or to build their own streaming applications. Basically, Wowza does streaming, transcoding and more - better than anyone. 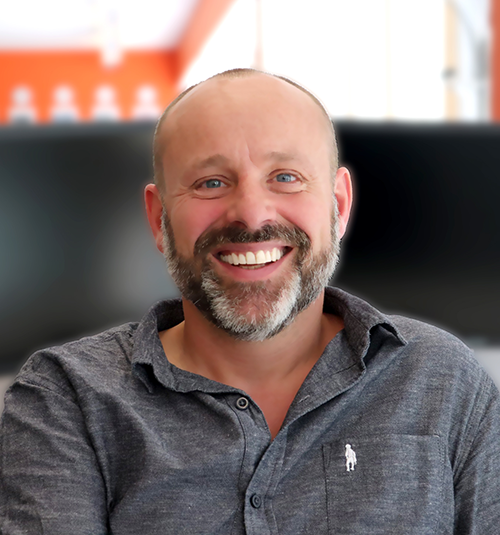 At WorkCast, we have built the world’s best webinar platform which provides total video support “natively” – through our ‘in-stream’ technology. ‘In-stream’ technology transcodes all the inputs and interactivity to your webinar into a single live video stream. This includes webinar features like presenters audio from phone bridges, webcams, voip, slides, animations and video embedded in slides. 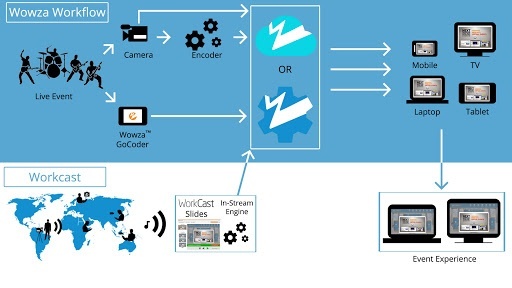 WorkCast is architecturally built using video streaming technology and not just as a web camera after-thought. This is fundamentally different from other webinar providers who only stream webcam video but push slides and other content by outdated methods such as flash or installed plug-ins. Without in-stream technology, webinar platforms can not support video embedded in slides. If you want to make engaging webinars you need to use video in your slides. 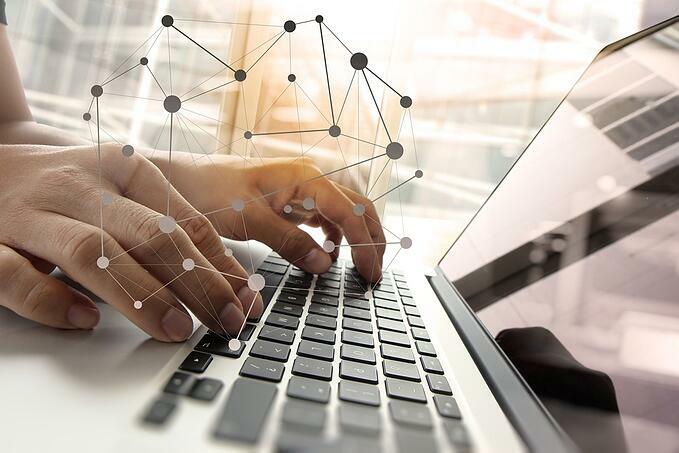 Without in-stream technology, you cannot embed webinars into your website and have to rely on audineces viewing them in the 3rd party provider interface that is often flash reliant. Wowza ingests WorkCast webinar streams and can transcode them just like any other live video stream. Our in-stream webinars can therefore be broadcast in any format to basically any device. This opens up a vast world of distribution never before accessible by a webinar platforms. As WorkCast webinars are video streams, we can deliver webinars in the WorkCast player in a standard HTML page. The WorkCast platform adds to the player and web pages all the additional features of a webinar such as registrations processes, security access, pre and post event emails and live webinar interactivity like polls and surveys. WorkCast is a cloud webinar platform. It can be configured to push to WorkCast’s own Wowza infrastructure and onto their CDN, or to push the in-stream content directly to a customer’s own Wowza infrastructure. 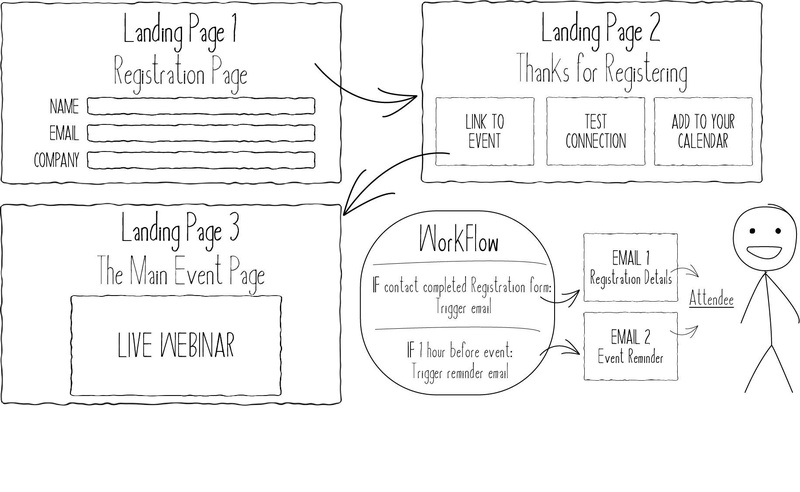 This ability to use existing infrastructure for Webinars is a fantastic way to increase the ROI on Wowza investments. Typically, one barrier to utilizing Wowza infrastructure is video production costs. This can be relatively straightforward for a presentation from a single site without slides. However, when you want to extend the event to include international presenters or even PowerPoint slides, it becomes a lot more onerous to produce and often external video production companies and associated costs are needed. With WorkCast, this complexity disappears as the event can exist in the cloud, with all sites with presenters connected by a stream, webcam, VOIP, phone and all able to share slides and work together. This stream as with a standard company webcasts goes straight to the wowza infrastructure and gets distributed. At WorkCast we are truly excited about the opportunities WorkCast with Wowza presents! Customers are confirming that this convergence of webinars with video and webcasts is removing the barriers for webinars. WorkCast with Wowza is supercharging webinars and is the future of direction of the entire webinar industry.